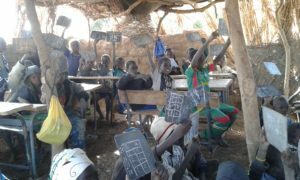 On the morning of 4 January in Koulou, the primary school children, a total of 324 pupils, were eagerly awaiting the laying of the first stone of their new school. The first, second and third classes are now under a thatched roof supported by a wall of mud mixed with straw, now badly deteriorated by time. Providence has allowed the Villa Brea Missionary Group to go beyond its expectations and has committed itself to the construction of a new school. The parents of the students have traced and dug the foundations. Brother Albino laid the first stone in the presence of the students, the teachers, the regional inspector of education, the head of the village, the parents, the volunteers and Brothers Julien and Romain. 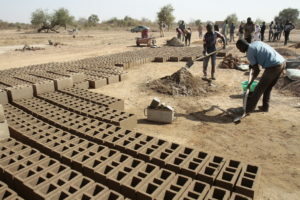 The parents and the population are working to produce the bricks and continue working. 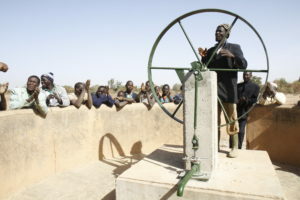 The joy was completed with the inauguration of the Volanta pump which has replaced an old Indian pump and will supply water not only to the school but to the whole village.